Love new tech? Take part in market research and get paid to test it! Who doesn’t love technology? Our lives are full of wonderful gadgets and gizmos and consumers are clambering to get their hands on the latest developments in the dazzling world of tech. However, before new products reach the hands of the general population, they need to be thoroughly tested. There are now loads of studies happening in technology, so if you take part in market research, you might be lucky enough to experience the most exciting new products before anyone else. Wearable tech has boomed massively in the UK, with sales of smart watches and fitness bands rising an incredible 118% in 2015 (Mintel, 2016). 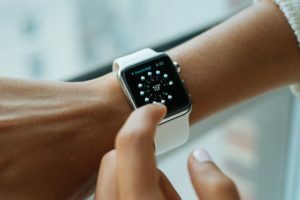 Wearable tech is often associated with health and fitness, but smart watches can be used for all sorts of different stuff from checking the weather to paying for your weekly shop! Another super popular type of wearable technology is the GoPro, which is often used in extreme sports but, because it can be easily mounted on your body, it is brilliant for capturing a first-person view of your life. Not long ago, we had a research study that enabled participants to wear a GoPro around a homeware store to understand their journey through the shop. GoPro’s are perfect for paid market research as researchers can observe consumer’s shopping habits and store journey which helps big brands improve their products and services. Another example of this was recently, we were asked to conduct a research study using Google Glass! People who had or were going to have the flu vaccination had to wear Google Glass to their doctor’s appointment and record the experience and the communication in the surgery about the flu. Sound good to you? Take part in market research here. Virtual reality, or VR, is no longer science fiction: this new and emerging technology is creeping into our daily lives and will have a huge impact. VR will be used for everything from crime scene reconstruction to training surgeons, but you’re most likely to experience it in the comfort of your own home through gaming or other types of entertainment, and tech geeks have probably already heard of brands such as Microsoft Oculus Rift or PlayStation VR. This incredible technology could be used in future paid market research by placing people in specific virtual situations and testing their reactions. The future has definitely arrived! Whether you’re training for a full-on Ironman competition or just want to lose those love handles, there are lots of options when it comes to fitness trackers, with brands such as Polar, Fitbit and Garmin developing new models. They can be used to gather data, such as your heart rate or daily step count, monitor your sleeping pattern or track your GPS location, which is handy for runners. We’ve recently conducted a research project where people suffering from depression had to rate their mood a few times throughout the day using the Apple Watch. What if you ran out of washing powder and could order more with the press of a button? How about if you could remotely ask the kettle to boil just before you got home from work? These things may sound space age, but they are slowly becoming the norm. In-home tech is controlled by Wi-Fi and is usually synced to your smartphone via an app, enabling you to do everything from adjusting the thermostat to switching on a lamp over the internet. Amazing! There are plenty of paid market research studies that are testing this nifty new technology – in fact, we conducted a study just recently testing the latest in-home voice recognition technology. You can take part in market research here. How many apps have you got on your phone? Lots, right? Every one of those apps had to be tested as it was developed, plus it has to be tested again when it is updated, making it the most common type of technology testing in paid market research. We recently asked participants to test a payment app for a large petroleum company to see if this would work within their petrol stations throughout the UK, people loved it and they got paid to fill up their tank – win win! Having a go with a new app is lots of fun for you, and helps companies to understand the user experience, as well as getting feedback on the look and feel of the app. Christmas is almost here which means it’s time to drink mulled wine, stuff our faces with mince pies and be merry! But for big brands, Christmas means a battle for the best advert. A battle that costs about £5.6bn by the way! Now, you may not be making an ad of your own, but this time of year is a costly one for us all! So, if you’d like to know how to make extra money before Christmas, why not check out our other blog posts for useful tips? Without further ado, check out our 5 fave Xmas ad’s below – which one is your favourite? We didn’t expect M&S to pull out all the stops this year and found this ad a bit of a dark horse in the running and it seems to have captured the hearts of the nation! We absolutely love the combination of Christmas meets glamour with the focus being on Mrs Clause this year and how visually stunning the ad is. It’s also super heart warming to see Mr and Mrs Clause together – we’re suckers for a happy ending! John Lewis never hold back with their big budget adverts and this year was no exception. As one of the most highly-anticipated adverts of the year they had a lot to live up to – especially with past Christmas campaigns (throwback to the snowman X-mas ad) being so successful. Although this year’s advert may have faced some criticism, we still love it! Animals seem to get us, every damn time. This beautifully animated story of Buster the boxer letting loose on the trampoline was clever, funny and emotional (as ever). Although it’s not a typical Xmas ad, the Santa forgot campaign by Alzheimer’s Research UK is a compelling and touching advert that shows Christmas from a different perspective. We love how this advert is beautifully animated to capture the attention of all ages and to educate them of an extremely important cause during this time of the year. It’s also great to see an advert that focuses its attention on something other than the monetary aspect of Christmas. An unexpected entry into the battle for the best Christmas advert 2016 and we loved it! Although, if you haven’t seen this ad – BEWARE – it’s a real tear jerker! Get tissues. Many tissues. Heathrow really has portrayed the message of coming home for Christmas being the best gift of all and I am sure we can all relate to this. We all look forward to seeing our family, loved ones and friends over the festive period, especially if we don’t get to see them as often as we would like. It’s also cute as hell. Why do bears make us so emotional?! Sainsbury’s have really upped their Christmas advert game in recent years (who remembers their 2014 campaign?) and it’s paid off. This year’s advert contains comedy, fantastic animation and an extremely festive vibe. We think that Sainsbury’s this year have really driven home the aspect of being surrounded by family and loved ones during the Christmas period. It also gets us thinking about the less fortunate and how we can help these people. Plus, the ad includes stop-frame animation which is gorgeous and features the vocals from James Corden – what’s not to love? Quick shout out to the Coca-Cola Christmas advert too, just because it really isn’t Christmas without it…holiday’s are coming after all!